198 Commonwealth is located on the south side of Commonwealth, between Exeter and Fairfield, with 25 Exeter (196 Commonwealth) to the east and 200 Commonwealth to the west. 198 Commonwealth was designed by Allen and Kenway, architects, and built in 1880-1881 by Hewitt & Webster, masons, and William Welch as the home of William A. Matthews, Jr., and his wife Annie Bolton (Fay) Matthews. Annie Matthews purchased the land for 198 Commonwealth from the Commonwealth of Massachusetts on June 21, 1880, and is shown as the owner on the original building permit application, dated July 15, 1880. Click here for an index to the deeds for 198 Commonwealth. By the 1881-1882 winter season, William and Annie Matthews had made 198 Commonwealth their home. 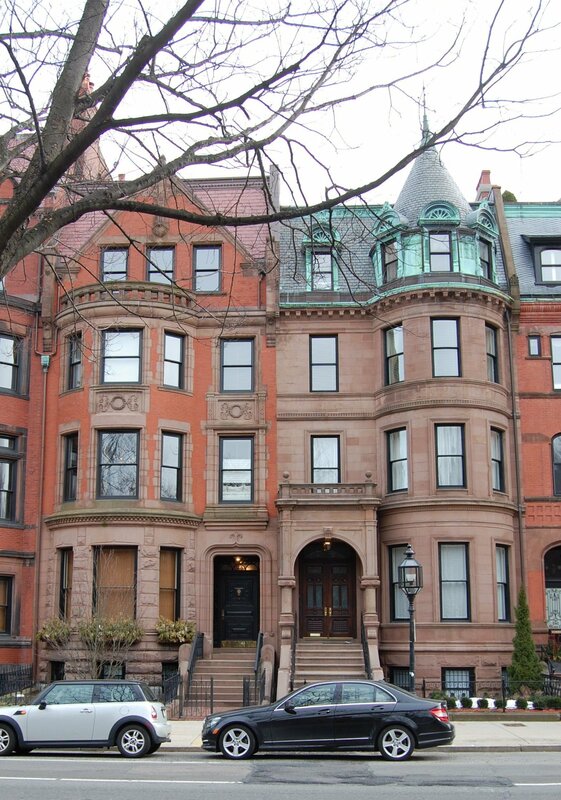 They previously had lived on Glenvale Terrace in Jamaica Plain, which they continued to own. He was a wallpaper manufacturer and dealer. Living with them at 198 Commonwealth were their daughters, Anna (Nanna) Bolton Matthews and Alice Maria Carter Matthews, and William Matthews’s sons by his previous marriages: William A. Matthews, a dealer in silver-plated wares and later a real estate dealer, Francis (Frank) H. Matthews, a wool dealer, and Edward Clark Matthews, a wallpaper dealer in his father’s firm. William and Frank Matthews were William Matthews’s sons with his first wife, Elizabeth Ryder (Carter) Matthews, who had died in November of 1854; Edward Matthews was his son with his second wife, Caroline Adams (Clark) Matthews, who had died in January of 1862. Frank Matthews married in August of 1892 to Louise E. Lewis. After their marriage, they lived in Milton. From about 1897, the Matthews family was joined by Annie Matthews’s nephew, Leroy Burgess Fay, a wool salesman, the son of her deceased brother, William Fay. Leroy Fay continued to live with them until his marriage in January of 1906 to Elizabeth Murphy. After their marriage, they moved to Newton. Alice M. C. Matthews died in May of 1897 while traveling in Paris. Anna B. Matthews married in August of 1898 to Wallace Bryant. He was a portrait artist and she became a noted artist and sculptress. After their marriage, they moved elsewhere, and by the 1900-1901 winter season they were living at 9 Exeter, owned by her mother. Edward Matthews married in January of 1914, to Mary Louise Shannon and they moved to the Matthews’s home in Jamaica Plain. Annie Matthews continued to live at 198 Commonwealth with her stepson, William, until her death in May of 1916. She also maintained a home, Angleside, in Waltham. After her death, William Matthews moved to 140 Pinckney. In her will, she left her properties to various charitable institutions, with the bequests to become effective upon the death of her sister, Sarah Maud Fay, and of her daughter, Anna (Matthews) Bryant. Among the properties was 198 Commonwealth, which she left to the Boston Nursery for Blind Babies. 198 Commonwealth was managed by Annie Matthews’s estate, which converted it into a lodging house. In December of 1916, a Building Department inspection indicated that alterations had been made in the house and an application had been filed to convert it into a “high class boarding house,” but that no permit had been issued because there was no second means of egress from the fourth floor. By the 1917-1918 winter season, 198 Commonwealth was the home of Mrs. L. E. Barry, who probably operated it as a lodging house. 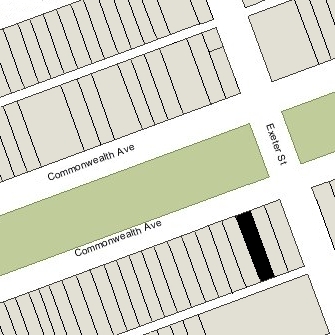 By January of 1920, at the time of the US Census, the residents of 198 Commonwealth were all employees of a private school, probably the Guild & Evans School for Girls located at 200 Commonwealth. The school had recently been acquired by Miss Augusta Hortense Minerva Choate, who lived at 200 Commonwealth. Later in 1920, she moved the school to the Eben Jordan estate at 1600 Beacon Street, renaming it the Choate School for Girls. It remained there until 1950. By 1922, 198 Commonwealth had been converted into the medical offices of Dr. William Phillips Graves and Dr. Frank Pemberton, both of whom were physicians. 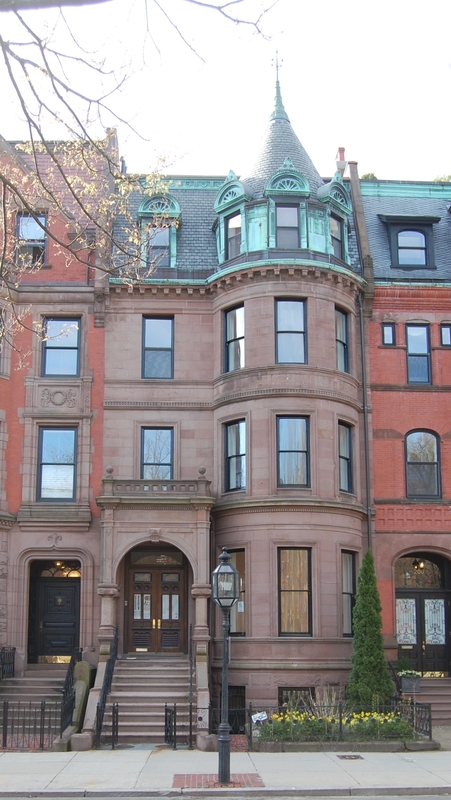 Dr. Graves, who also was a professor at Harvard Medical School, lived at 244 Marlborough and had maintained his office there in 1921. 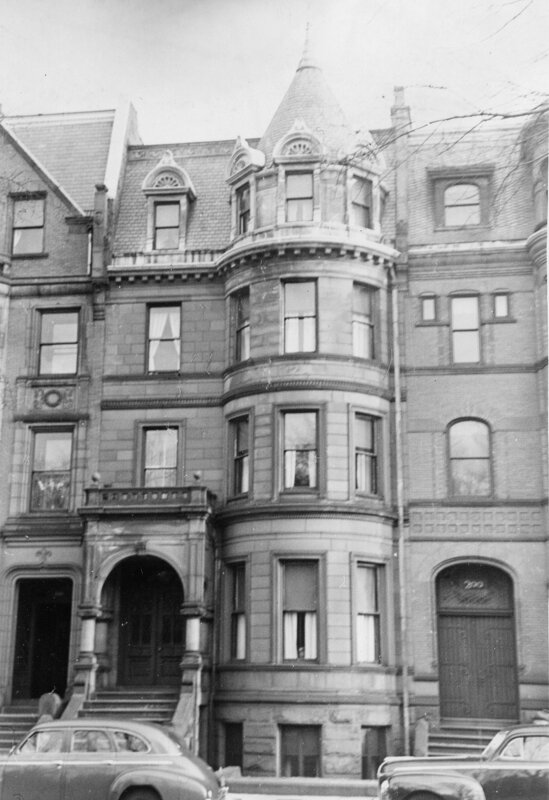 Dr. Pemberton lived in Brookline and had maintained his offices at 311 Beacon in 1921. Dr. Graves continued to maintain his offices there until his death in January of 1933. After his death, his son, Sidney Chase Graves, also a physician, maintained his practice there until about 1936. Dr. Pemberton and several other physicians also maintained offices there until about 1936. By 1934, 198 Commonwealth also was the home of Dr. Marshall Kinne Bartlett and Dr. Hugh Carroll Donahue. both physicians. They previously had lived at 524 Commonwealth. Dr. Bartlett maintained his office at 264 Beacon, and Dr. Donahue maintained his office at 520 Commonwealth. By 1935, they had been joined by Dr. Jack Spencer, also a physician. Marshall Bartlett married in about 1935 to Barbara Hume and they moved to Dedham. Dr. Donahue moved to the Hotel Fensgate at 534 Beacon in about 1937 and Dr. Spencer moved to 129 Bay State Road at about the same time. 198 Commonwealth had continued to be owned by Annie Matthews’s estate. Her sister, Sarah Maud Fay died in January of 1921 and her daughter, Anna (Matthews) Bryant, died in June of 1933. Under the terms of Annie Matthews’s will, after her daughter’s death, the property was transferred to the Boston Nursery for Blind Babies, located at 147 South Huntington in Jamaica Plain. On March 16, 1937, 198 Commonwealth was purchased by Jenny Karoline (Knudsen) Gegan, the widow of Charles Gegan, who operated it as a lodging house. She previously had lived at 226 Huntington. She continued to live there until about 1941, when she moved to 93 Beacon. She continued to own 198 Commonwealth. On July 10, 1953, 198 Commonwealth was acquired from Jenny Gegan by Miss Clara Rita Drucker, a legal secretary, who conveyed it on August 28, 1953, to Anna Pearlmutter, trustee of the Pearlmutter Trust. The property subsequently changed hands and on March 12, 1957, was acquired by real estate dealer Edward Swartz. On October 31, 1957, 198 Commonwealth was acquired from Edward Swartz by Barnett Feldstein and his wife, Edith (Martin) Feldstein. On July 1, 1960, 198 Commonwealth was acquired from the Feldsteins by Mabel Harriet (Carpenter) Perry, the widow of James Leland Perry. She lived in Keene, New Hampshire. 198 Commonwealth remained a lodging house until about 1963. On June 1, 1963, it was acquired from Mabel Perry by Newbury Halls, Inc. In September of 1963, it applied for (and subsequently received) permission to convert the property from a lodging house into a dormitory for Newbury College. On August 10, 1964, it was acquired by Back Bay Dormitories, a wholly-owned subsidiary of the College. 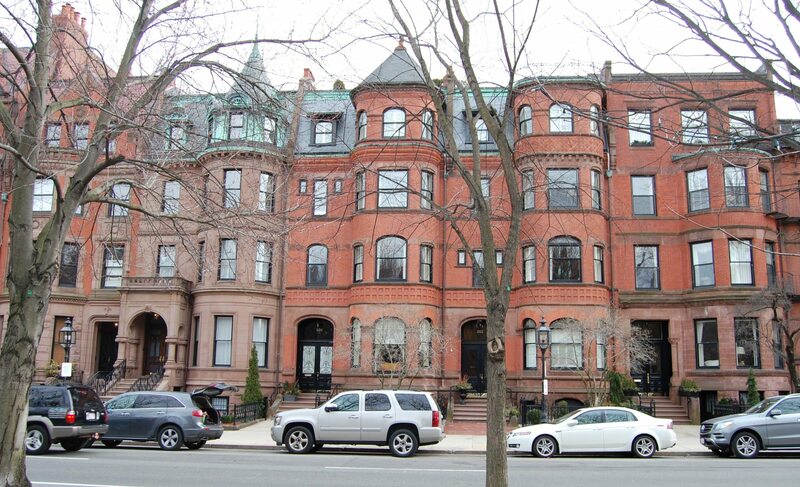 By 1968, Back Bay Dormitories owned 198, 200, 202, 204, and 206 Commonwealth and 138 Marlborough. On December 29, 1986, it transferred all of these properties to Newbury College and liquidated its operations effective the end of the year. Newbury College continued to operate the properties as dormitories. On December 6, 1996. 198 Commonwealth was purchased from 202 Commonwealth, Inc., by Ronald L. O’Kelley, chief financial officer and treasurer of State Street Corporation, and his wife, Lesley B. O’Kelley. 202 Commonwealth, Inc., retained 200-202-204 Commonwealth, combined the properties, and converted them into eight condominium units in January of 1998. In April of 1997. the O’Kelleys applied for (and subsequently received) permission to convert the property from a dormitory into a single-family dwelling. On December 12, 2002. Ronald O’Kelley transferred his interest to his wife. On December 29, 2003, Lesley O’Kelley entered into a “Preservation Restriction Agreement” with the National Architectural Trust for the purpose of ensuring preservation of 198 Commonwealth’s exterior. 198 Commonwealth remained a single-family dwelling in 2016.